Every distinct set of tiles has certain features, and we are always interested in those that introduce something new or combine features in a new way. 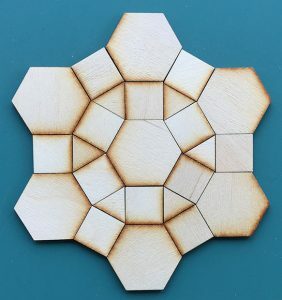 Dylan Thurston, who helped us determine the boundaries of the Twin Dragon introduced us to the decomposable fractal Penrose tiles first described by Bandt and Gummelt. 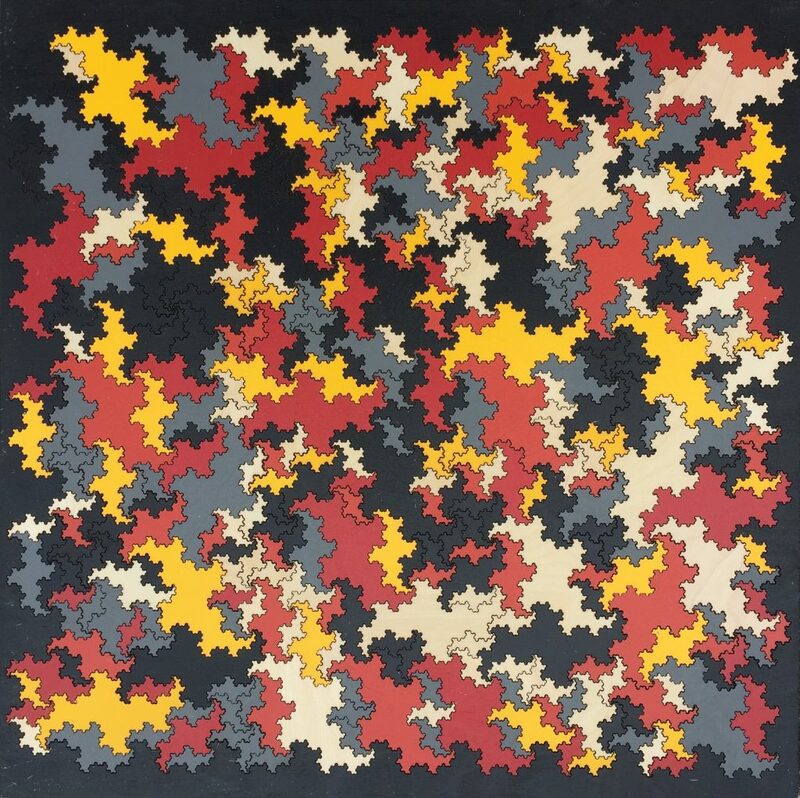 By decomposable, we mean every tile can be represented as a combination of other tiles. 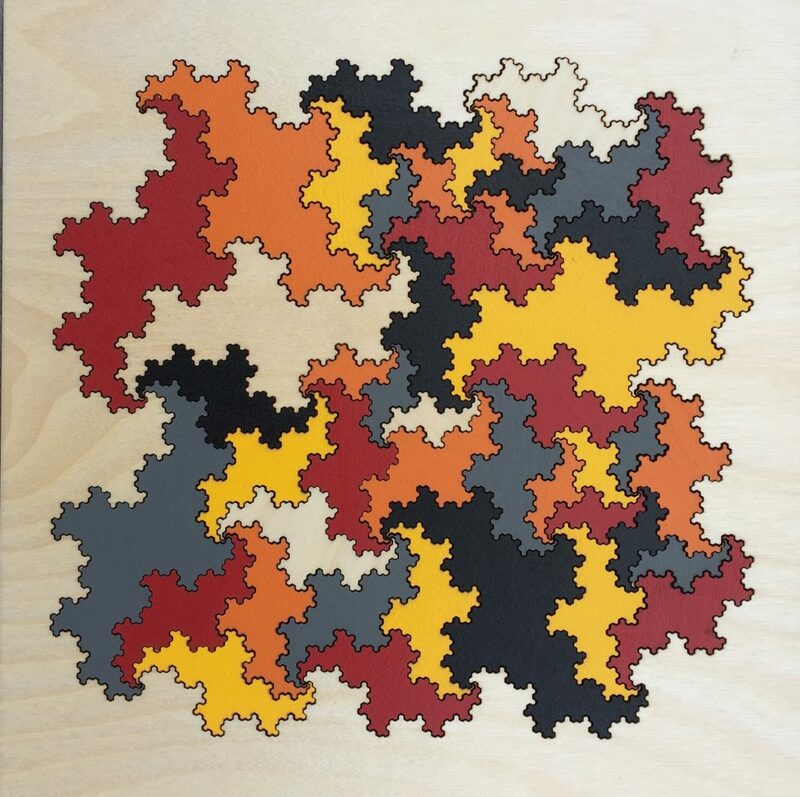 The boundaries are fractal, like the Dragon and Twin Dragon tiles. 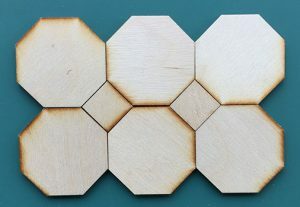 And finally, like Penrose P3 tiles, there are two shapes, and they only tile the plain non-periodically (i.e. they don’t repeat like wallpaper). 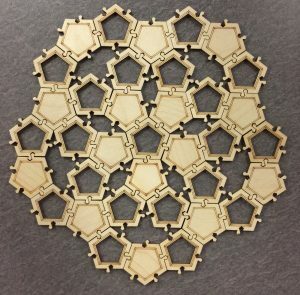 Each shape can appear in any number of sizes. 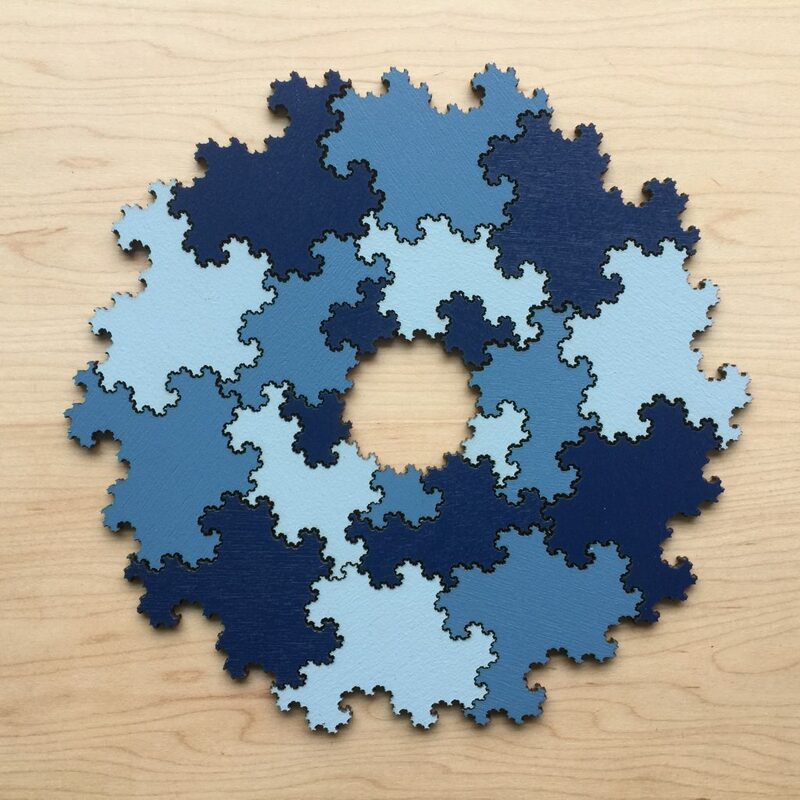 To get to the next larger size, you scale the dimensions by the golden ratio \(\phi \approx 1.618\). 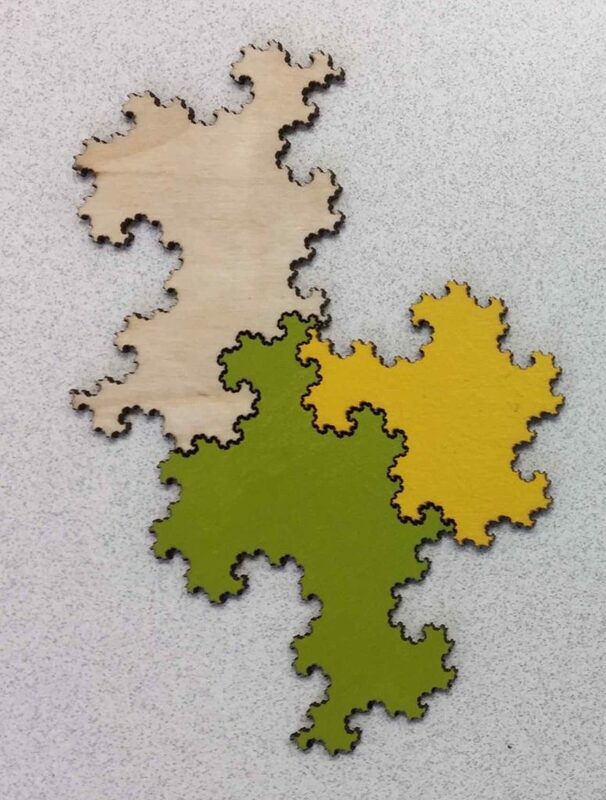 Our prototype tiles below show how a terrier can be decomposed into two smaller terriers and a poodle. Can you also see how a poodle can be decomposed into a terrier and a poodle? These tiles are decidedly more challenging when it comes to creating an uninterrupted tiling. 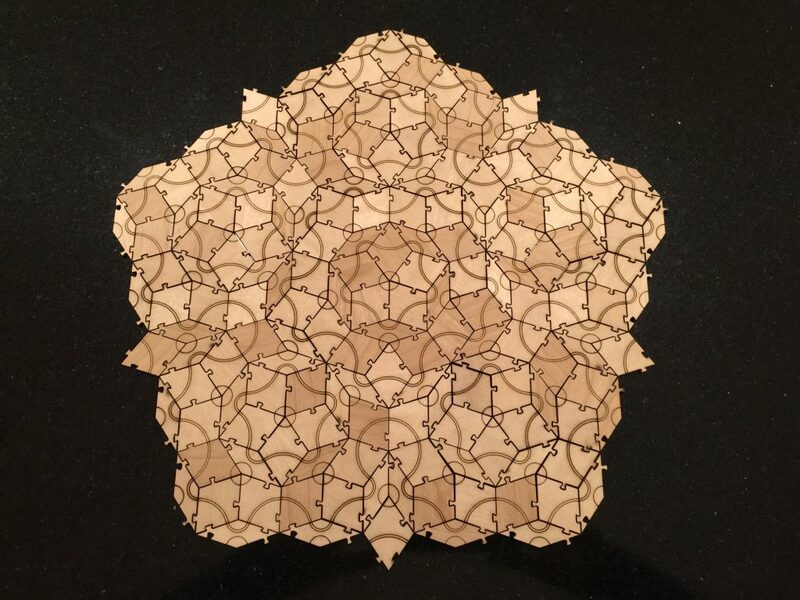 At craft shows, we often encounter people who are torn between fractal tilings and Penrose tilings. Now you can have it both ways! 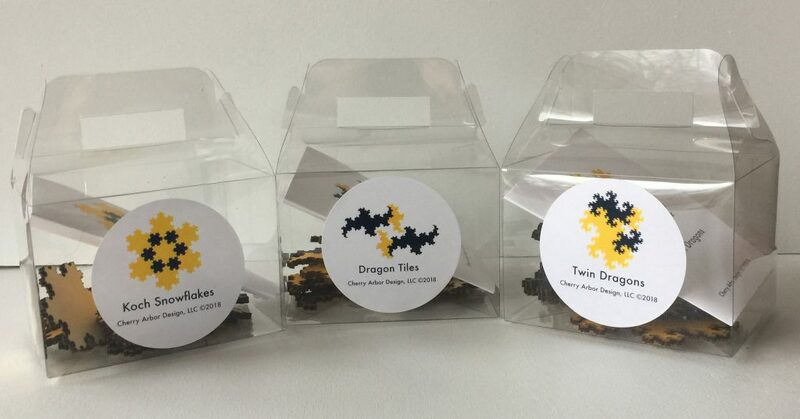 After creating the Dragon tiles, we thought it would be cool to do the Twin Dragon, which has much more frilly edges. All of the descriptions of the Twin Dragon that I knew of focused on the space-filling curve that defines the interior of the dragon. But I wanted to generate just the border. Dylan Thurston found an elegant procedure that enabled us to create Twin Dragon boundary at any level of detail. Here’s a pair of finished twin dragons. 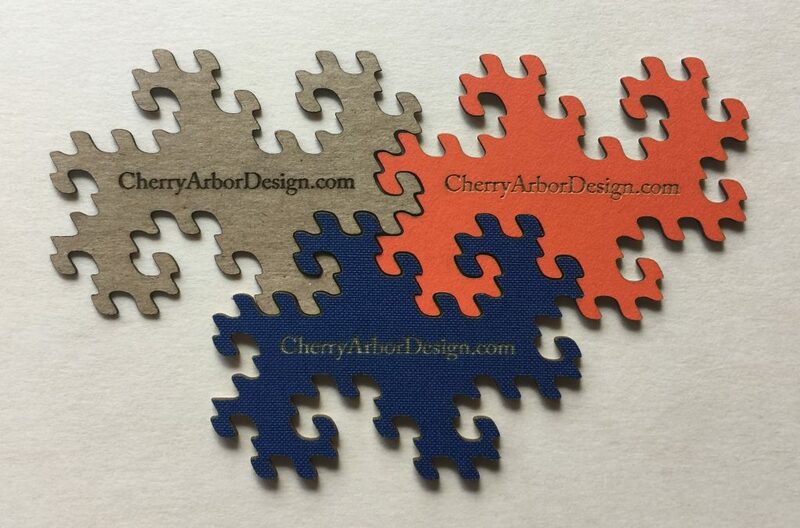 We recently made some business cards using a low-detail twin dragon. Here’s a framed version of a complete set of our tiles. Heidi used colors that evoke mid-century modern. We loved it when our son Max’s girlfriend, Karen, paid us a visit. 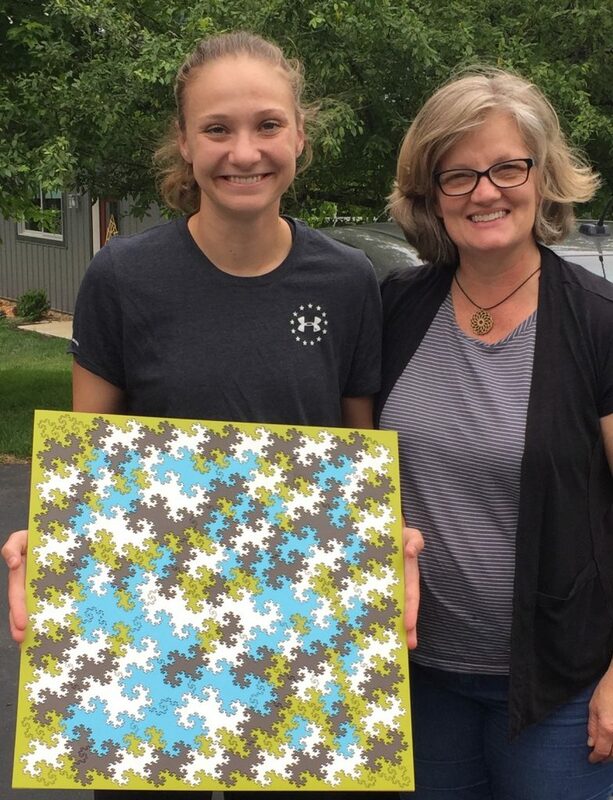 Heidi set her up with a Twin Dragon puzzle. Dylan Thurston recently connected us with Melissa Freilich at the Ann Arbor Civic Theater, who was directing Tom Stoppard’s play Arcadia. 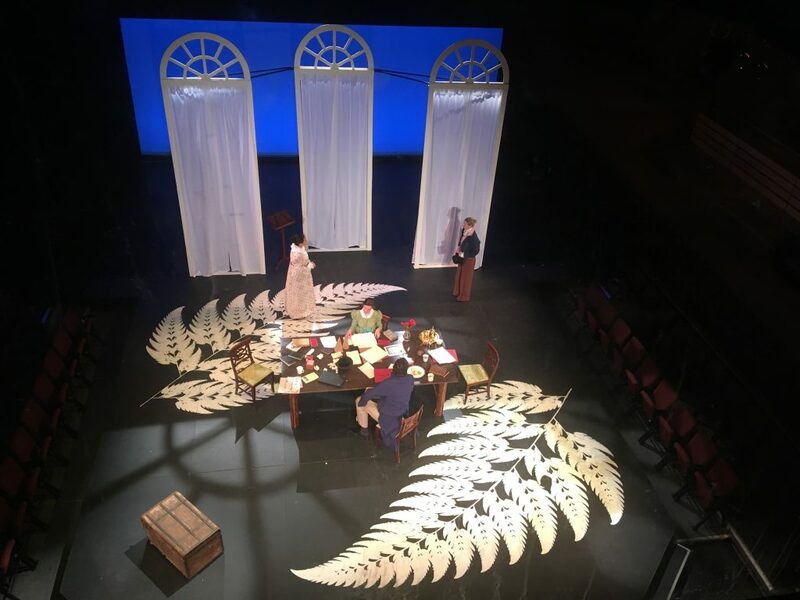 Because of the fractal themes in the play, Melissa wanted to create images of large fractal ferns, known as Barnsley ferns, for the set. 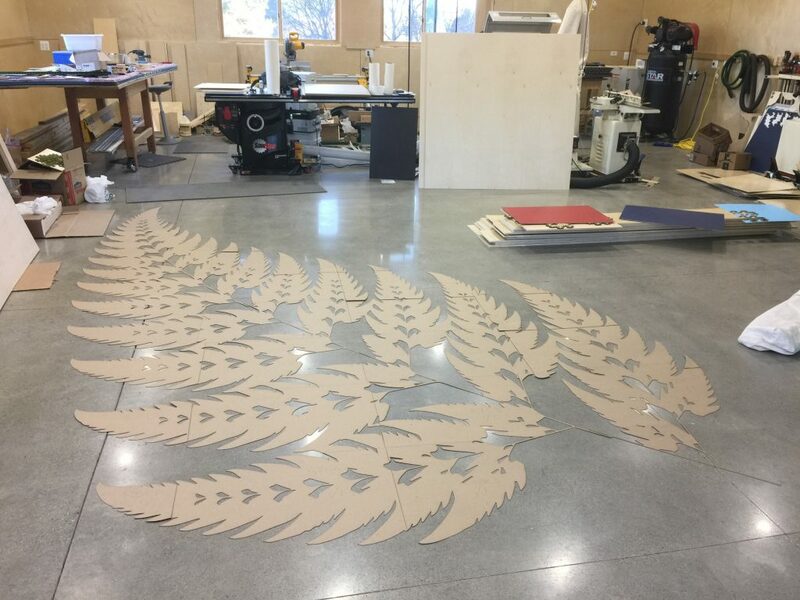 We worked with her to determine the scale, and after some thinking, came up with the idea of creating a set of chipboard stencils that her set crew could use to paint 24 foot ferns. The Barnsley fern is not drawn in the typical way. Rather, it generated from a sequence of random numbers fed into an algorithm. Here’s an example. If you refresh your browser, you can watch it recreate itself. And here’s the final product that playgoers got to see. Nice work by the artists! Congratulations to the 2018 University of Michigan Math grads! It is April 27th, 2018, and today is commencement for over 200 undergraduate and graduate students in the Department of Mathematics. 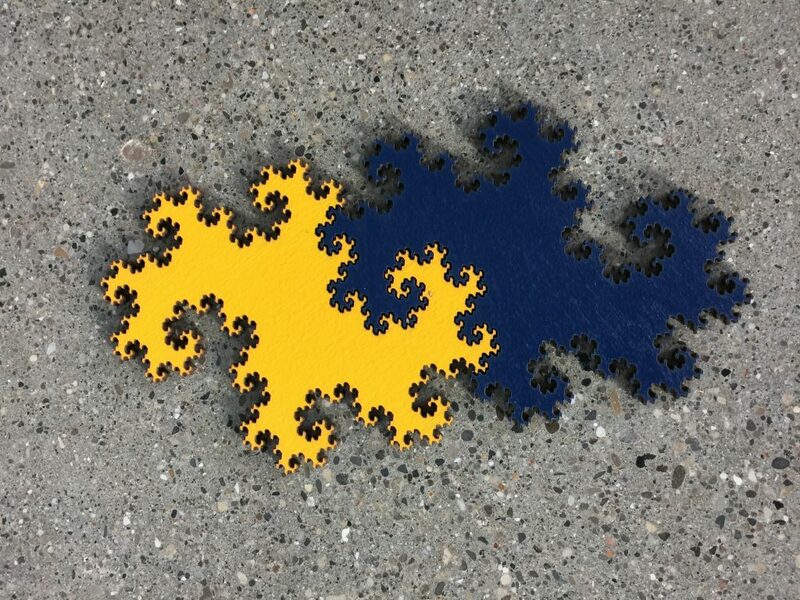 Each student received a mini fractal puzzle in Maize and Blue colors. We wish you well! 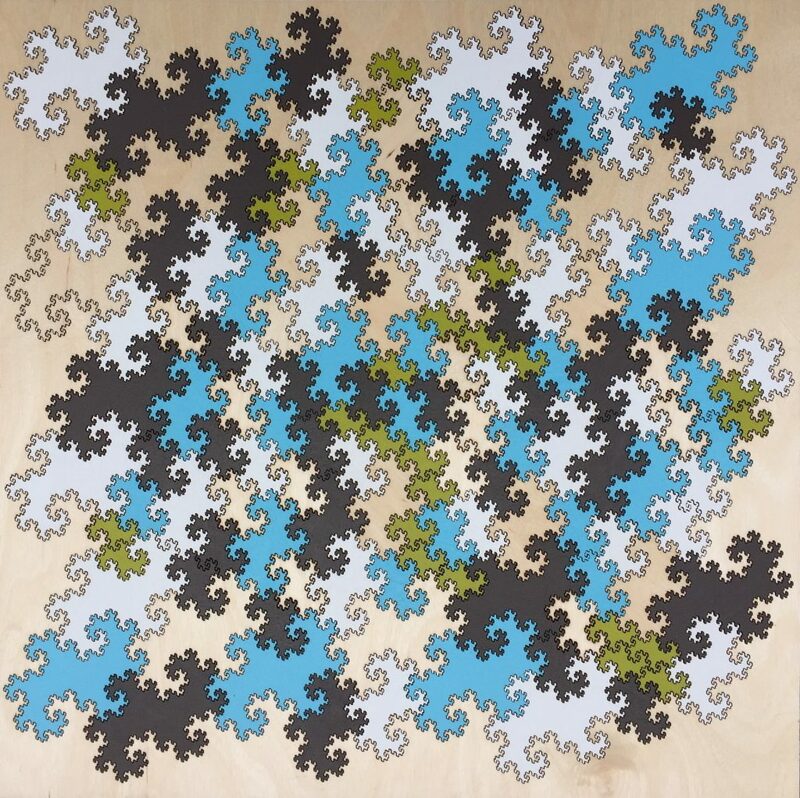 Because there are multiple solutions, we don’t select the number of tiles based on a particular solution. 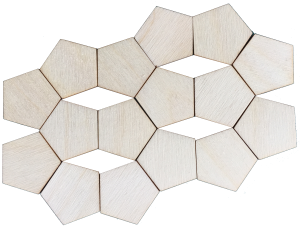 Instead, we choose the number of pieces based on the proportions of tiles that would appear if you tiled the entire, infinite plane. 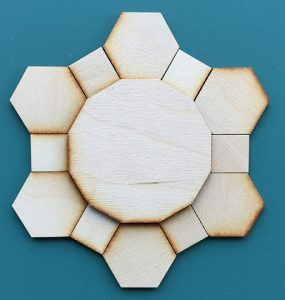 The idea is that on average, you can use most of the tiles. 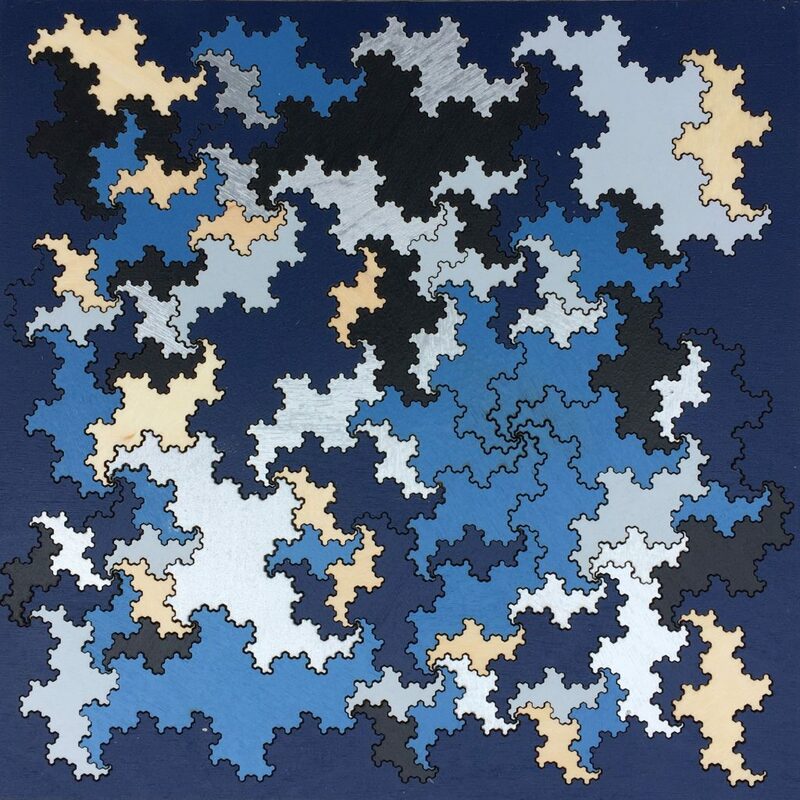 For Penrose P2 and P3, the larger tiles appear more often, and in the ratio of the golden mean, which is about 1.618 to 1. 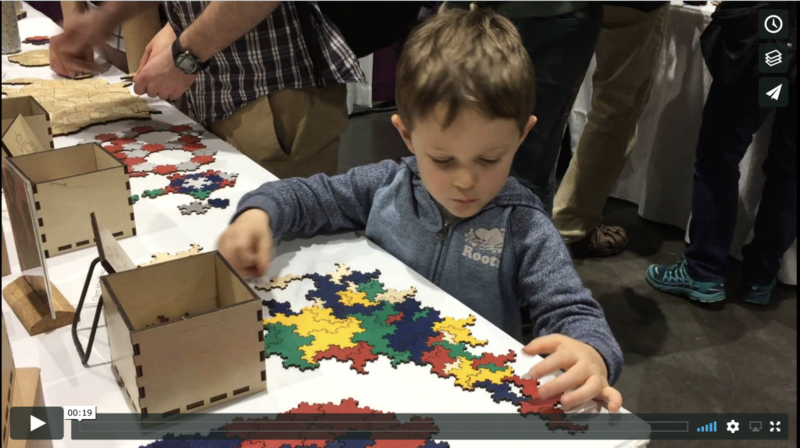 So, for example, if we put 100 smaller tiles in a box, we would put 162 larger tiles in the box. 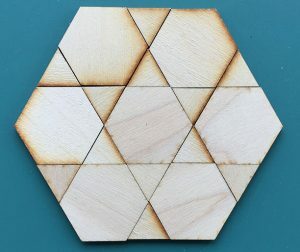 For P1, it is a bit more complicated, since there are 6 different tile shapes: 3 are based on pentagons, one is a thin rhomb, one is based on a star shape (called a pentacle, and the other is part of a start (called a half-pentacle). 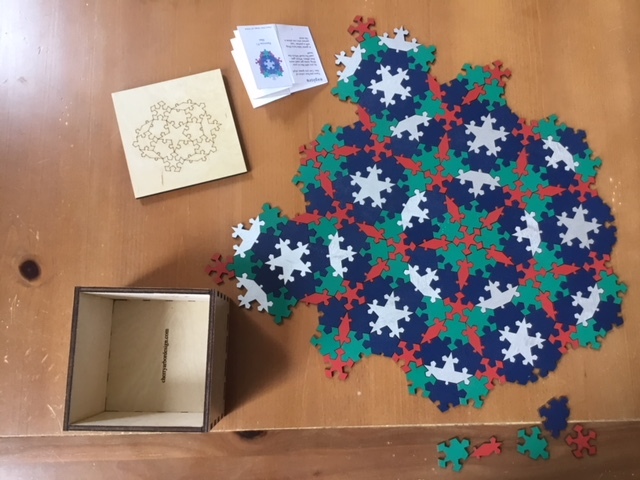 Using the colors from Chet and Esther’s set, as a puzzle is expanded, the proportions will converge to 3.8% for the pentacle, 8.6% for the half-pentacle, 13.5% for the rhombus, 10.9% for the red pentagon, 27.8% for the green pentagon, and 35.4% for the blue pentagon. So is there a solution that uses all the tiles? Maybe, but we don’t know! Fibonacci‘s famous sequence (0, 1, 1, 2, 3, 5, 8, 13, 21, 34, 55, …) has been linked to many natural phenomena. The arrangement of seeds in sunflowers is one example. 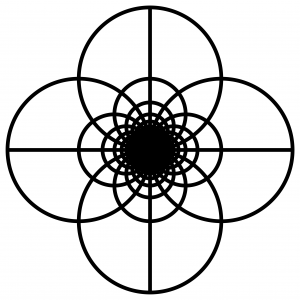 The construction of the sunflower spiral can be described as a series of steps, moving out a certain distance from the center of the circle and rotating a fixed angle for each seed. 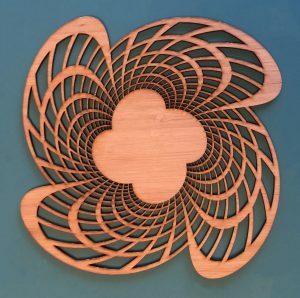 So, you can create some beautiful patterns, and with the laser cutter, you could cut out the circles. But I was also interested in the idea of the dots representing the center of cells. 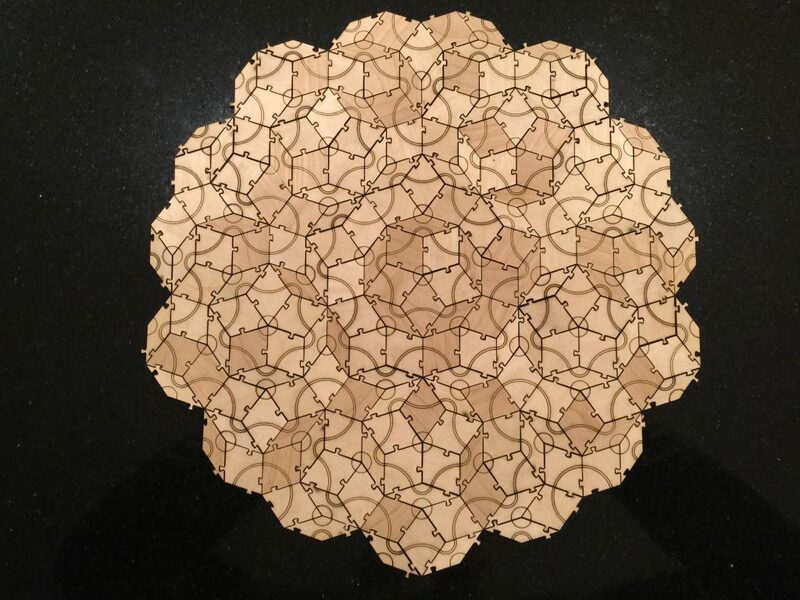 Enter the Voronoi diagram. Given a set of points, it finds cells containing those points, with the property that any border that separates two points is equidistant from the points. Eko Hironaka was interested in a design that was more suggestive of 12 hours, and created the design for Eko’s Flower. This is a repost of ideas that I used in the classroom. 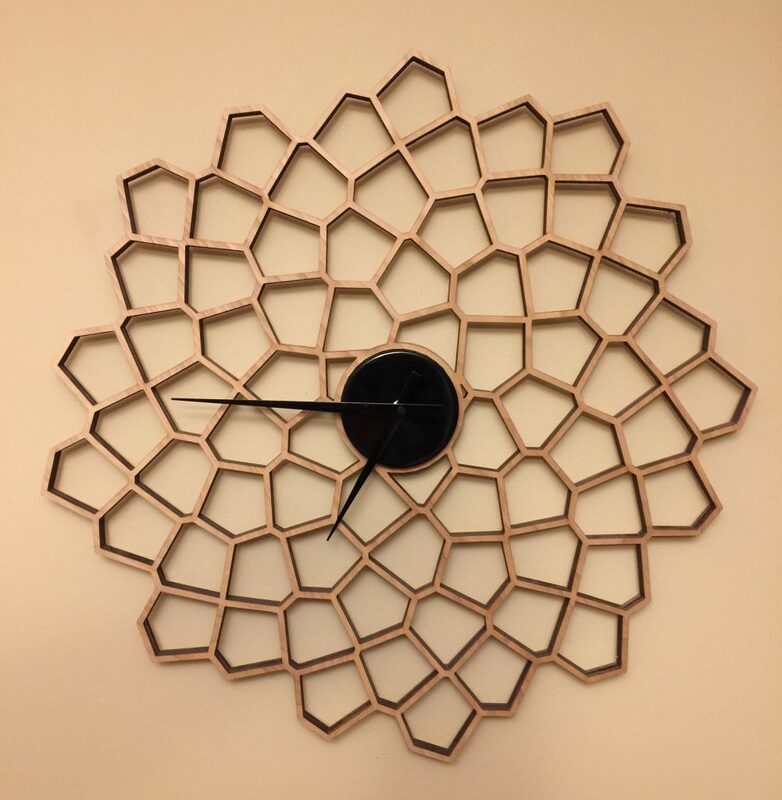 The design below was created using inversive geometry, combined with a twisting rotation. Inversive geometry is a nice way to introduce the idea of switching back and forth between different geometries, which can lead to the study of this Poincaré disk. The ideas are accessible with using just geometry. Inversive geometry requires that we have a circle of a given radius \(r\). Consider any point in the plane, at distance \(d\), lying on a ray from the center of the circle. Then that point has an inverse point, at distance \(r^2/d\) from the center of the circle, on the same ray. Taking the inverse of a point flips points from outside the circle to inside the circle, and vice versa. Imagine the plane being made out of flexible material, and inverting is like puncturing the plane at the center of the circle, and then turning the plane inside out, with the points on the edge of the circle remaining stationary. 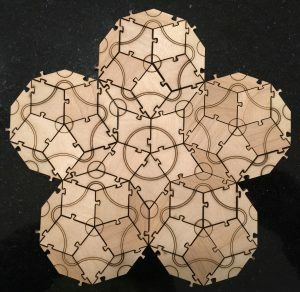 You can play with this in desmos by clicking on the graph below. The orange disk is the unit circle. The red dot can be dragged. The green dashed line segment from the red dot towards the origin leads to the purple point, which is at a distance that is the reciprocal of the red dot’s distance from origin. What shape is traced out by the inverse point as we slide the red dot along the line? Is this always the case? Now, consider infinite graph paper with integer coordinates. The lines consist of all vertical lines with integer \(x\) values, and all horizontal lines with integer \(y\) values. What do you get if you find the inverse of all those lines? This mapping of the entire plane outside the disk into the unit disk (and vice versa) is a conformal mapping, which means it preserves angles. If we define distance between two points in the disk to be the same as the distance between the inverses of the points, then we are preserving distance. Angles are the same and distances are the same, so we could study the ideas in high school geometry, but staying entirely inside a disk. What project ideas does this give you?